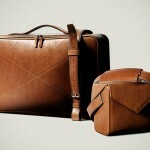 There are a handful of “high-tech” suitcases out there. 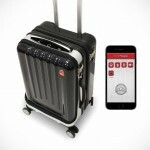 We have seen quite a bit here, but if you’d prefer a high-tech travel roller designed and made by a long-standing, reputable bag maker over those offered by untested startups, well, here it is, the first ‘connected’ luggage from bag and gadget accessories maker, Incase. 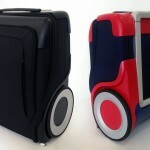 Called NoviConnected 4 Wheel Hubless Travel Roller, this sleek, minimalist suitcase features a class-A makrolon polycarbonate shell, polyester jacquard interior liner and futuristic-looking, hubless smooth glide wheels that are removable. Why removable? I have absolutely no idea. Perhaps, it facilitates easy replacement when the needs arise? NoviConnected does not promised to self-drive like some suitcases out there do, but it does offer the basic, a rechargeable battery that packs a whopping 10,050 mAh, that should please most modern day nomads. With integrated USB ports, this high-capacity battery is capable of fueling up USB-C and USB devices simultaneously, thus essentially turning your travel roller into a mobile power hub. A built-in indicator, conveniently located next to the ports, lets you in on the battery/charging status. It even comes with a1.5 meter (5-foot) USB-C to USB-C cable too – a thoughtful inclusion as, unlike regular USB cables, USB-C cables aren’t as commonly own by gadget owners at this point. With the Incase Smart app, you can record your bag’s location, get it to alert you if it stray out of range, as well as sharing your NoviConnected information and keep an eye on the accessories’ power levels. Other highlights include a voluminous 4L interior (1+ US Gallon), TPU grab handles, retractable telescopic handle, integrated TSA approved lock, mesh pockets with zip closure, a smaller zipper pocket for lose items, and finally, each NoviConnected 4 Wheel Hubless Travel Roller include a complimentary laundry bag. NoviConnected 4 Wheel Hubless Travel Roller is offered in a selection of colors and it is available now for $299.95.